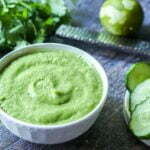 This cold cucumber soup with avocado & lime is the perfect low carb lunch on a hot summer day. One of the summer soups that takes just a few ingredients and a high speed blender! Only 5.4g net carbs. Add all ingredients to a high speed blender and blend until nice and creamy. Taste and adjust if necessary according to your likes. If you would like it thinner, try a little water, chicken broth or even coconut milk.